EGI's Research eNewsletter October 2011: bringing you the latest product and event information. EGI is pleased to announce the next generation in HydroCel Geodesic Sensor Net (HCGSN) technology. The HCGSN 130 provides the same sensor layout and electrode performance as the earlier HCGSN 120. The new design features a more rigid connection of the wires to the electrode pedestal, introducing strain relief, and making the HCGSN 130 Nets faster to apply and position. New electrode labels are easier to read, as well as being IR-camera ready for use with EGI’s Geodesic Photogrammetry System (GPS) 2.0, planned for release in the Fall of 2011. The HydroCel Geodesic Sensor Nets are a part of the Geodesic EEG System, which includes the Net Amps 300 amplifier and Net Station software for acquisition, review, and analysis of EEG data. Systems are available in moderate density (32- or 64-channel) or high density (128- or 256-channel) arrays, in configurations for routine or extended monitoring or for use in MR environments. Read the full article for more details on the technology behind the HCGSN. | Request a quote. At the 2011 annual meeting of the Organization for Human Brain Mapping in Quebec City, Canada, EGI sponsored a symposium discussing the use of anatomical constraints to improve source localization. Cutting-edge research was presented by EGI scientists as well as scientists from the University of Oregon (UO) and from Washington University in St. Louis (WUSL) to the well-attended workshop of over 100 participants. The symposium highlighted techniques for improving scalp EEG-based source estimation by using individual head models. The speakers presented their research on the creation of accurate head models, as well as evaluation of these models using well-defined paradigms. Read the full article for details and to see data showing dense array EEG mapping of the hand regions of the motor cortex and somatosensory cortex. The last few years have been particularly productive for many of our customers in China. Using EGI dense array EEG systems, as well as other EGI-supported technology, such as the E-Prime Workstation for Net Station and GeoSource source estimation software, our colleagues in China are publishing the results of cutting-edge research on a wide range of topics. One particularly strong area of focus has been affective neuroscience, a field that extends traditional cognitive neuroscience methodology to the study of emotional processing. Guangheng Dong at Zheijiang Normal University and his colleagues have published several papers in this field, including those on impulse control and facial processing (Dong et al., 2009, 2010, 2011). A group of researchers from Northwest Normal University mapped the neural response of bias toward self-relevant possessive pronouns, confirming that these pronouns are psychologically important (Zhou et al., 2010). In another interesting study, two Beijing researchers, ChunPing Chen and YueJia Luo, investigated the effect of positive mood on attention to stimuli. Their findings, which suggest that attention to negative stimuli decreases with positive mood, have important implications for people suffering from mental disorders such as social phobia and social anxiety (Chen and Luo, 2010). Lastly, a study on the development of emotional processing, conducted in collaboration between labs at Beijing Normal University, Boston University, and the University of Michigan, demonstrated that the brains of preschool-aged children respond more to positive feedback than to negative feedback during learning (Mai et al., 2011). Read the full article for a summary of studies in social and cognitive neuroscience and novel EEG methodologies. | See our publications page for an updated list of citations from EGI customers in China and around the world. Electrical Geodesics, Inc. (EGI) is pleased to announce that GeoSource 2.0 is now cleared for clinical use with adults and children three years of age and older in the US. GeoSource 2.0 is also CE marked under the Medical Device Directive in Europe and has received license approval by Heath Canada. GeoSource 2.0 allows the use of 128- or 256-channel scalp EEG data to estimate the source of electrical activity within a high-resolution atlas model of the brain using the well-known distributed, discrete, and linear inverse solutions LAURA, LORETA, and sLORETA. As a part of the clearance process, EGI was required to submit both simulated and actual epileptiform patient data to demonstrate the performance and limitations of the source imaging methods used. Read the full article for more details. | Request a quote. Read the June 2011 Research Newsletter for more information about Net Station 4.5 and the Metafile Format. 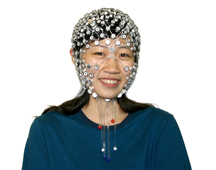 A video published on JOVE shows real-world research use of the Geodesic EEG System. Adekemi Akano, David Haley, and Joanna Dudek from the Department of Psychology at the University of Toronto, Scarborough, demonstrate how they use EGI’s dense array EEG to study social cognition in infants. Detailed written instructions, representative data, and analysis methods are also shown. A July 2011 article in "Scientific American" highlights the new area of neuroeducation. The article features Dr. April Benasich at Rutgers University, who uses dense array EEG to understand the essential processes that underlie learning. An important goal is to see if it is possible to determine, years before going to school, whether a child may have learning disabilities in certain areas. Understanding how sleep interacts with cognitive processing, development changes, and overall health has generated great interest in the past decade. EGI’s cutting-edge dense array EEG (dEEG) technology has made it possible for scientists to advance the understanding of how sleep interacts with behavioral and cognitive processes. EGI’s dense array EEG systems provide better spatial sampling of the scalp data compared to older EEG technologies, allowing researchers to observe finer resolution of brain activity patterns than have been possible in the past. Using dEEG for sleep research allows the user to investigate fine topographical changes in sleep patterns. For instance, Massimini et al. (2004) used 256-channel EEG to show that slow oscillations (<1Hz) during sleep are exhibited on the scalp as a “traveling wave” with a reproducible propagation pattern and origin site that spans across nights and participants. Murphy et al. 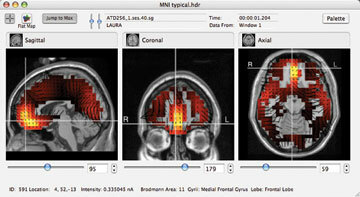 (2009) used dEEG to source model slow waves during sleep that supported the conclusions from Massimini’s previous scalp analysis. And just this year, a dEEG study showed a comparison of slow waves in propofol anesthesia and slow waves (SW) recorded from natural sleep and reported that the propofol SW were spatially and behaviorally different from naturally occurring SW (Murphy et al., 2011). Read the full article for reviews of new data in sleep and learning, epileptiform activity during sleep, and a complete list of references. The complete syllabus can be found on the EGI website. Registration is now open for the Israel and Australia schools. Each year, EGI sponsors a two-day BESA workshop featuring basic usage of BESA software, as well as tips and tricks for optimal use. This hands-on workshop is taught by BESA experts, and provides both new and experienced researchers a means to have all of their questions answered in person. Each attendee will have a BESA computer with which to follow along in the tutorials, which begin with the basics and proceed toward more advanced subjects. See the syllabus for the course. Free tuition is available for EGI customers who are currently covered by an EGI support contract with its accompanying tuition waivers. Also, purchase of any BESA license via EGI provides free tuition to our workshop. The venue is Washington, DC, November 10 and 11, which is just before the annual Society for Neuroscience Meeting. We are delighted to announce the hire of Suhas Vinchurkar, who will be based in Bangalore, India, to provide support for our customers in India and surrounding regions. Suhas has a degree in Naturopathy and Yogic sciences from the Rajiv Gandhi University of Health Sciences and is near to completing his doctoral degree in yoga and sleep at S-VYASA University, Bangalore, India. His work focuses on ascertaining the positive effects of integrated approach of yoga therapy in treating obstructive sleep apnea syndrome (OSAS). Through his research, Suhas aims to develop a special yoga therapy module for treating OSAS. Suhas also works at the Indian Council of Medical Research (ICMR) Center for Advanced Research in Yoga and Neurophysiology, Bangalore, India, where he uses our 128-channel MR compatible Geodesic EEG System. He has designed, developed, and managed a large number of experiments based both on Net Station and E-Prime platforms inside and outside the MR scanner environment. With this wealth of clinical and research knowledge, he is an excellent addition to the support team. Please join us in welcoming Suhas to the EGI team. As EGI continues to grow, we are developing more products, providing more customer support and doing more research than ever. To make sure that we continue to provide you with all the latest information about EGI, we are very pleased to announce the hire of Jill Hendrickson as Marketing Manager. Jill has a Ph.D. in Molecular Biology and over 13 years of experience in marketing, market research, and product development from the biotechnology sector. She brings a wealth of knowledge on scientific marketing and marketing communication and has a true customer focus to all of her work. With Jill’s marketing experience, we will be able to bring EGI to the next level of growth, while maintaining our close relationships with our customers. Please join us in welcoming Jill to EGI. Are you interested in an exciting career with EGI? See our Employment section for current job openings. We currently have openings for an Equipment Sales Account Manager and Support Engineer I. If you have experience in EEG, these positions provide an opportunity to apply your academic knowledge in a new environment, interacting with research and clinical customers all over the world. In the second quarter of 2011, over 50 different papers were published using EGI’s Geodesic EEG Systems for research. These new publications cover a wide range of advances in neuroscience and medicine, including research on Parkinson’s disease, autism spectrum disorder, social cognition, language comprehension, attention, sleep, anxiety, stress, and more. You may access the list of Q2 2011 Customer Publications, as well as the complete list of publications here. You can find EGI scientists and staff at the following conferences. Please visit us at our booth. We would be interested in talking with you about your research.